The Freedom Ring offers a uniquely American experience. I can’t deny that I love traveling the world in search of new and exciting gemstones. But nothing gives me greater pleasure than finding a unique stone at an incredible value right here in the United Sates of America. The green beauty of helenite could not have been made in any other nation on earth, as the raw material has its origins in the Mount St. Helens volcanic eruption of 1980. 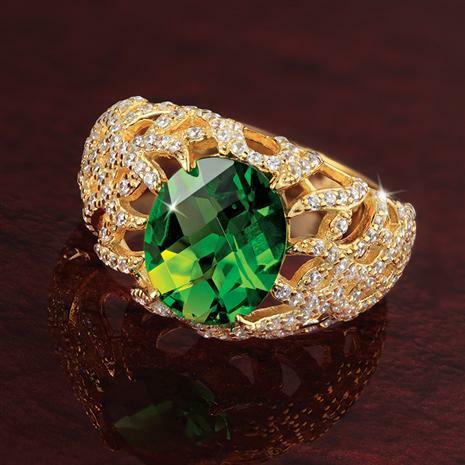 The central stone in the Freedom Ring is an oval, faceted helenite stone, displaying an intense green that lesser stones from other nations can only dream of matching. The generously sized four-carat Helenite stone is set in a gold-finished .925 sterling silver ring and surrounded by exactly 176 dazzling white lab-created DiamondAura® stones. Citizens of other nations will be green with envy when they see we’re producing such stunners over here. And, because we’re selling an American-born stone directly to our customers right here in the land of the free, we’re able to keep the price down. When you slip on the Freedom Ring, you best be prepared to dazzle onlookers and do your country proud, because they don’t make them like this anywhere else.